Founded in 1996, Lightyear Property Management Corp. has grown to become one of the foremost property management companies in Rockland County, New York. We pride ourselves on our hands-on and pro-active management approach. Many of our properties have been long-term clients as a result of this approach. Laurence D. Palant, company founder and President, is intimately involved with the day-to-day operations of all of our clients. In addition to site management, Mr. Palant is involved with all financial aspects of each association. 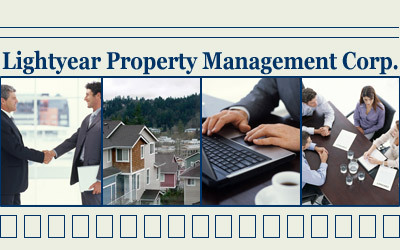 Our firm�s expertise comes from Mr. Palant�s involvement with property management dating back to 1978. He has the unique position of having worked on both sides of the table, having been a condominium president for 6 years. He understands the expectations and problems Boards of Managers possess. This website was created to assist the residents of our client associations in the dissemination of documents and forms relating to property leasing or resale along with rules and regulations. In addition feel free to utilize the maintenance request area of this site for any maintenance or accounting issues. Thanks for visiting Lightyear Property Management Corp.